okay most likely a weird thing, but my first impression of a laundry soap always comes from smell. When I opened this new soap with crystals fragrance I was expecting a strong scent. It was actually quite a light scent, which is good because as I have mentioned before to much scent is bad for my middles sons skin. Lucky for me I had several load of laundry available when this product arrived, so I started my laundry machine right up. It was simple to use just add a cap to the wash and watch it go. I was shocked when the laundry came out that the scent was actually much more noticeable, but still not overwhelming. as far as the Dirt Lift action I did not notice any difference from the traditional laundry soap I had been using. All together though it is a great product. If you are a prior reader you know the great part of being in the Purex Insiders group is that I get 3 product coupons to give away to my readers. I have added these to our Spring Cleaning Giveaway! So head over HERE and make sure to enter for a chance to win a big prize package of great products. 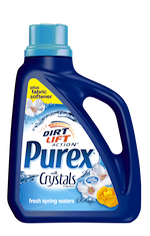 Also don't miss out on the Purex Sweepstakes going on new! I was just going to try Purex for the first time, thank you for a great review it helps me know I am making a good change.